The past week of wholesale polished diamond trading was marked by a price softening in Israel. The small firming up of prices that took place seems in retrospect temporary, and the price softening that started in early March during the trade show in Hong Kong, continued this past week, with the GDX index declining 0.09%. 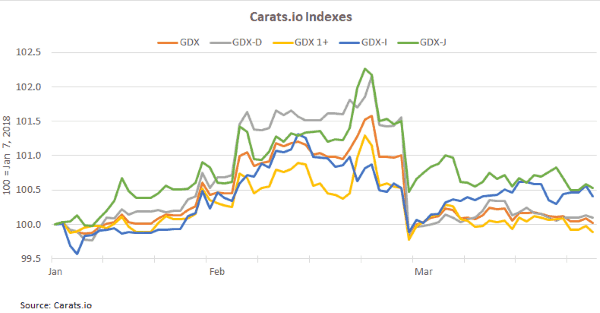 GDX, Carats.io’s general index, averaged 10,007.68 during the 12th week of the year (March18-24). The index represents the most tradable diamonds in the Israeli diamond market. The GDX index opened the week at 10,012.28 and closed at 10,002.46. Prices rose for all categories on Friday, though not enough to overcome the week’s declines. Polished diamond prices rose ahead of the Hong Kong International Diamond, Gem and Pearl Show, held February 26-March 2, and then softened in response to less than expected demand. At one point Israeli diamond traders pushed up prices to meet demand levels, reflecting ongoing strengths, however that did not last long, leading to the past week’s declines. Israeli traders took advantage of the firm asking prices for polished diamonds by traders in India, and lowered prices to grab the opportunity. The largest declines were among the smaller goods, below 1 carat, as reflected by the GDX-D index, an index of smaller size diamonds weighing 0.18-0.99 carats. This is a major reversal from the trend of the past few weeks when smaller goods, mainly 0.30-0.39-carats, posted sizable price increases, possibly a price correction. The GDX-D index averaged 4,003.9, down 0.12% compared to the preceding week. Conversely, GDX-J, an index of the most popular diamonds for the US jewelry market that has posted declines every week in March, posted the smallest decline during the past week. GDX-J averaged 3,018.7 in the past week, losing 0.04% compared to the prior week. The GDX-I index, which represents the top color and clarity polished diamonds traded in the market, which was the strongest performer during the past four weeks, also declined in what is understood to be a price correction. Despite the declines late in the month, Carats.io’s second month of indexed pricing, asking prices of polished diamonds increased overall during February. The rise was fueled by retailer restocking in the US following the November-December Holiday Season, a trade fair held at the Israel Diamond Exchange that generated large traffic and many transactions, as well as expectations for an active show in Hong Kong. During the month, the overall GDX index rose 0.85%. GDX-D increased 1.22%, reflecting strong demand for smaller diamonds in the US consumer market. Carats tracks the asking prices of tens of thousands GIA certified, round diamonds, with no culet that are offered on Get-Diamonds.